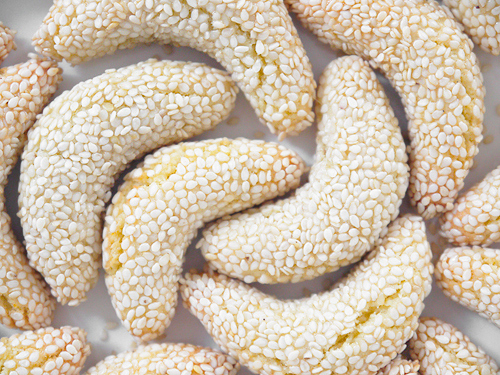 Biscotti di Regina originate from Sicily, and the name means “queen’s cookies”. I’m not sure if they are named for or after a particular queen, but with a name like that, they are promising a lot! 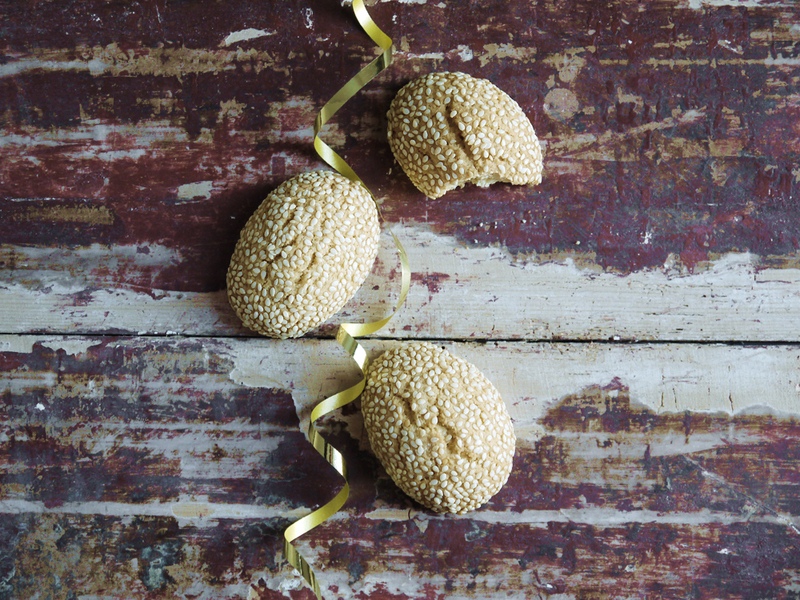 These delightful little morsels are sweet and buttery, with a coating of sesame seeds the pop slightly when you bite into them. They also look very pretty, as the seeds form a neat pattern on the outside of the dough. I think they are a nice addition to the festive table, providing a contrast to all that chocolate, ginger, citrus and dried fruit. Yes, I know, shocking to believe that those flavours can all get a bit much, but sometimes you want something simple to enjoy with a cup of tea. 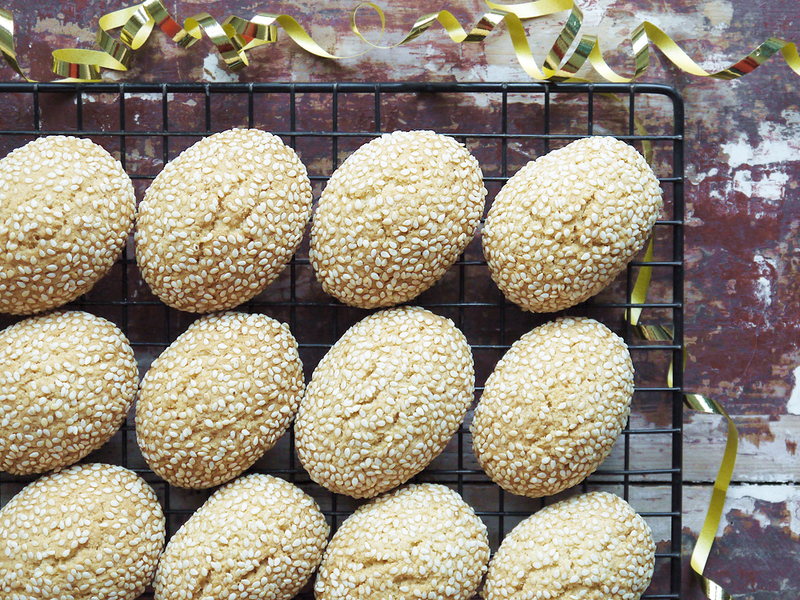 I think these cookies have something of a Middle Eastern flavour, what with the sesame seeds and orange blossom water. Hardly surprising when you think about the history of trade across the Mediterranean. However, if you want to play around with the flavours, you could swap the vanilla and orange blossom water for something else – aniseed is a typically Italian choice, and orange or lemon zest would add a stronger citrus note than the orange blossom water. If you’re feeling particularly creative, you could really depart from Italian flavours, and add things like cardamom or even rose water. There are even versions that use saffron, if you want cookies with a spectacular golden glow. These biscotti are very straightforward to make – just rub the butter into the dry ingredients, then add egg and flavourings to get a soft dough that is just very slightly sticky. You’re rolling these guys in seeds, so you want it to be a bit sticky. If it is clinging to your fingers in great lumps, you’ve probably got too much liquid, so just add a bit more flour. I shaped the biscotti by rolling into balls, then flattening into a squat sausage shape, so when they baked they formed an oval shape. If you prefer, roll them into very long, thin fingers for a more elegant shape to dip in coffee or vin santo, and adjust the baking time accordingly. 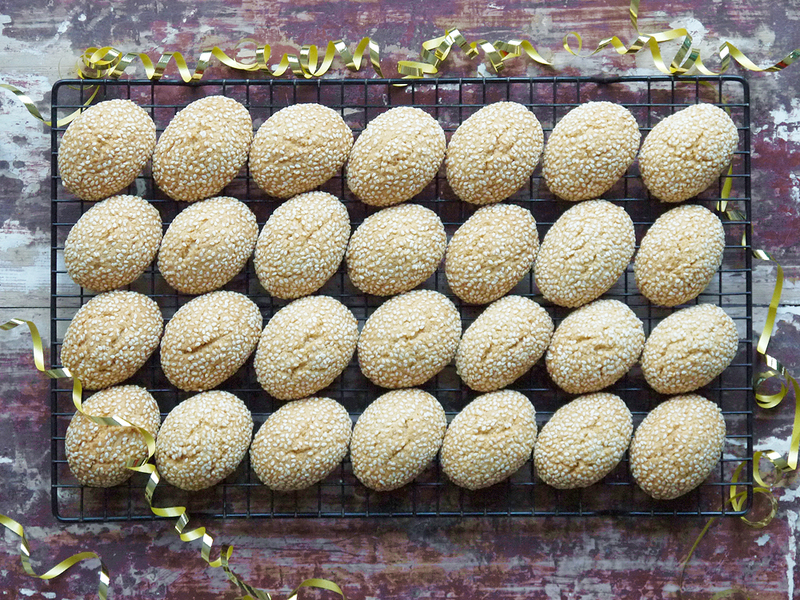 For finishing, I used hulled white sesame seeds, which I think makes them look quite festive, almost like they’re coated in snowflakes. If you’re feeling adventurous, add a few black sesame seeds for some contrast, or go the whole hog and roll them in only black sesame seeds for a dramatic look. 1. Preheat the oven to 175°C (350°F) and line a baking sheet with greaseproof paper. 2. In a bowl, combine the flour, sugar, baking powder and salt. Add the butter and work until it resembles breadcrumbs. 3. Beat the egg with the vanilla and orange blossom water. Add to the main bowl, and work to a smooth dough. If necessary, add cold milk, a tablespoon at a time, to bring the mixture together. It should be firm, but slightly sticky. 4. Divide the dough into three batches. Roll each piece into a long sausage about 30cm long, and cut into 10 pieces (3cm each). 5. Roll each piece into a ball, then form into a sausage shape between your hands. Roll in the sesame seeds to coat completely, then transfer to a baking sheet (leave enough space between each piece to expand). 6. Bake for around 25 minutes until golden, turning after 15 minutes to get an even bake.